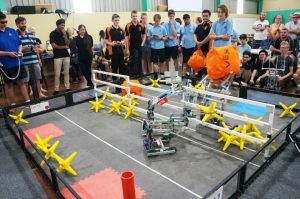 In early December, Danihers Facility Management client Galen Catholic College was proud to host the Australian Vex Robotics National Championships. Not only did Galen College host the competition, Galen students made it to the grand final and helped an alliance partner win the opportunity to represent Australia at the World Championships in Kentucky USA in 2017! There was an electric buzz about the stadium at Galen College as 32 teams from VIC, NSW and the ACT worked on a range of robots within specifications and budgets, with the ultimate aim to win games against the other teams. On the day, Galen hosted about 200 students, 50 teachers and family members, plus another 100 visitors who came along to find out what it was all about. The VEX Robotics Comp is not only about design thinking, programming and building robots. More importantly it is about cooperation and teamwork skills. These are put to the test as each team gets randomly drawn to form an alliance with another team. The two teams work together as an alliance to throw stars and cubes over a fence, against two other teams who are throwing them back over. It was great to see how the teams worked together. Our Galen students found the more they strategised with their alliance partner before a game, the more chance they had of winning. They really enjoyed the way the teams worked together. In one match the Galen robot was flipped and was stuck and couldn’t right itself. Our alliance team at the time, stopped what they were doing and used their robot to flip ours back on its wheels. In the final rounds all teams are lined up in order of ranking points (points they collected during each match). The top 4 teams get to choose who they want to take as alliance partners into the finals. 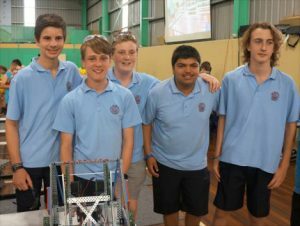 The top ranked team Emmaus College chose Borinya to be its alliance partner for the finals. The Second rank team Hillcrest College chose Galen as their alliance partners in the finals. The knock rounds began amongst the 4 alliances – with both the Emmaus/Borinya Alliance and Hillcrest/Galen alliance winning their rounds and heading to the Grand Final. No-one could have imagined both Galen and Borinya being in the Grand final of the Australian Championships – whoever the winner was it was a big win for Wangaratta. It was the best of three rounds and it went the whole three rounds, and the judges deliberated for quite a while, and finally it was announced that the Hillcrest/Galen alliance won. This meant that Hillcrest became the number 1 team of the event and will now be heading off to the world champs in Kentucky USA. The Galen Team can be proud of the fact they were chosen as their alliance partners and helped them get over the line. We couldn’t have asked for such a dream end to a fantastic day. Danihers has been a business partner at Galen Catholic College since early 2014, providing outsourced facility management services through their on-site Facility Manager, Cameron Eaton. Cameron is just as much a part of the Galen team as he is a Danihers person and nothing is ever a hassle for him.